With earnings season in full swing -- along with the Fed's rate-setting meeting on interest rates, the GDP estimate and housing numbers coming out -- the week ahead is shaping up to be a busy one. So here's a roundup of what's on the week's economic calendar. 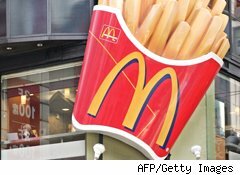 Quarterly earnings reports from American Express (AXP) and McDonald's (MCD) are expected to be the highlights. Analysts are looking for the charge card and travel giant to report fourth-quarter earnings of 94 cents per share (+37.2%) on revenue of $7.3 billion (+12.9%). The iconic burger chain is expected to post fourth-quarter earnings of $1.15 per share and $6.2 billion in revenue, up from $1.03 per share and $5.9 billion a year ago. Full-year results for both companies are anticipated to be similarly strong, and both have topped earnings estimates in recent quarters. Amgen (AMGN), CSX (CSX), Halliburton (HAL) and Texas Instruments (TXN) are also expected to report strong earnings results on Monday. The S&P/Case-Shiller Home Price Index for November is due out. Home prices fell more than expected in the October report, the fourth straight monthly decline. Also look for the Conference Board's Consumer Confidence Index for December. Analysts are looking for strong earnings reports from 3M (MMM), Altera (ALTR), Coach (COH), DeVry (DV), Norfolk Southern (NSC), Peabody Energy (BTU) and Yahoo! (YHOO) on Tuesday. They expect per-share earnings from Johnson & Johnson (JNJ), Kimberly-Clark (KMB) and Verizon (VZ) to be in the same ballpark as the year-ago period but to be lower for DuPont (DD), Quest Diagnostics (Q) and Travelers (TRV). And reported losses are anticipated from Harley-Davidson (HOG) and U.S. Steel (X). Defense contractor General Dynamics (GD) and conglomerate United Technologies (UTX) slide into the earnings spotlight. The former is expected to post fourth-quarter earnings of $1.85 per share (+28.8%) on revenue of $8.9 billion (+12.9%), while the consensus forecast for the later is $1.29 per share (+10.9%) and $14.8 billion (+4.6%). Earnings and revenue growth for the full year are expected as well. Earnings from these two companies have not fallen short of consensus estimates in recent quarters. Others companies expected to report year-over-year earnings growth on Wednesday include Abbot Labs (ABT), Automatic Data Processing (ADP), ConocoPhillips (COP), McCormick & Co. (MKC), NetFlix (NFLX), Occidental Petroleum (OXY), Qualcomm (QCOM), Rockwell Automation (ROK), St. Jude Medical (STJ), Starbucks (SBUX) and Xerox (XRX). Lower earnings are forecast for Boeing (BA) and Eastman Kodak (EK). Economic releases on Wednesday include new home sales and personal income numbers, as well as the outcome of the Fed's meeting. As the economic recovery plods along and QE2 continues to roll out, no substantial changes in policy are expected to arise from this meeting. More housing data is scheduled, with housing starts and the National Association of Realtors' pending home sales in December, as well as a look at durable good orders in December. Home sales may have inched upward last month. Quarterly reports are due from Altria (MO), Amazon (AMZN), AT&T (T), Bristol-Myers Squibb (BMY), Colgate-Palmolive (CL), Eaton (ETN), Eli Lilly (LLY), Motorola Solutions (MSI), Newell Rubbermaid (NWL), Time Warner Cable (TWC) -- all expected to post strong earnings results. But the highlights of the day may be results from Caterpillar (CAT) and Microsoft (MSFT). The world's largest producer of construction and agricultural equipment is expected to report its fourth-quarter earnings more than doubled from a year ago to $1.28 per share, while full-year earnings rose 44.8%. From the world's largest software company, on the other hand, analysts are looking for fourth-quarter earnings 8.1% lower year-over-year to 68 cents per share, though per-share earnings are expected to have grown 14.3% for the year. While Caterpillar's revenue is forecast to have surged in the quarter to $11.7 billion, Microsoft's may be about the same as a year ago, or $19.1 billion. Like Microsoft, Lockheed Martin (LMT), Nokia (NOK), Procter & Gamble (PG), and Raytheon (RTN) are also expected to post smaller earnings. Oil giant Chevron (CVX) is in the spotlight. Its anticipated $2.40 per share earnings represent a 36.3% annual increase, and its revenue is expected to come in 14.9% higher to $55.9 billion for the fourth quarter. The full-year forecast calls for $9.39 per share earnings and $204.3 billion in revenue. Note though that Chevron missed consensus earnings estimates in two of the past four quarters. Honeywell (HON) is expected to post a quarterly loss on Friday. End-of-the-week data on tap include the Employment Cost Index and the preliminary GDP estimate for the fourth quarter, as well as the latest Michigan Consumer Sentiment Index. Increased consumer spending and a narrower deficit are expected to have lifted GDP.